The MultiWash III microplate washer is a low-cost, 96-well microplate washer that represents the perfect balance between features and affordability. 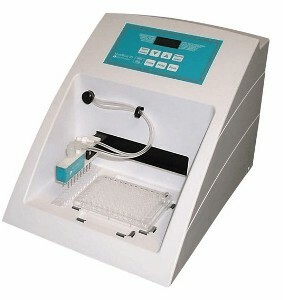 The MultiWash III Washer can be used to perform a wide range of assays including enzyme-linked immunosorbent assay (ELISA), enzyme immuno assay(EIA), fluorescent immuno assay(FIA), luminescent immuno assay(LIA), cytotoxicity assays, and agglutination tests in flat, round, or V-bottom microplates. It is configurable with user interchangeable wash manifolds to suit a variety of washing applications. The system is completely self-contained with no external pumps, and can be assembled and fully operational in just minutes. Once operational, the MultiWash III Washer can perform a 300 µL three-cycle wash on a 96-well plate in less than two minutes. For greater assay flexibility, users can wash any number of rows or columns, including washing the whole plate. All programming is done on the front display panel. No external computer is necessary for programming or operation.